“A read aloud that will fascinate younger students as it focuses on Emily Carr’s love of animals and her eccentricities, while older readers may notice some of her artistic techniques and her love for the outdoors. Emily discovers a small monkey at the pet store in Victoria and takes [her] home to be part of the menagerie that lives with her, but Woo’s inquisitiveness and habit of collecting stray items gets [her] into trouble. Fortunately, this story has a happy ending for both the artist and Woo. “Today, an Emily Carr masterpiece is much sought after by galleries and private collectors. However, when these iconic paintings of native culture and the wild beauty of the West Coast were being painted in the early 1900s, they were either misunderstood or ignored. The citizens in Victoria, BC, where Carr lived, were surprised when this eccentric individual adopted Woo, a small, forlorn monkey, to join her burgeoning menagerie. Although the mischievous Woo often created bedlam when she accompanied Emily, the monkey provided the artist with much joy and became her favourite pet. All went well, until one of Woo’s pranks nearly ended the monkey’s life. Inspired by Emily Carr’s The Heart of the Peacock, published in 1953, Monica Kulling has written a captivating tale about the devotion between an unappreciated artist and her animals, Woo in particular. Using simple prose, Kulling portrays the joyous chaos in Carr’s domain, but also makes reference to the underlying threat of her precarious financial situation. Dean Griffiths’ delightful watercolour and pencil illustrations depict the ambience of 1920s Victoria and its environs. The images of Carr and her social circle (both human and animal) are infused with a vitality that makes them much more than caricatures. 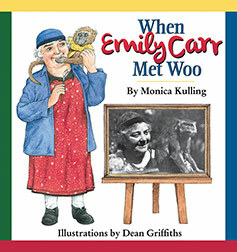 In only 32 pages, Monica Kulling is able to share the tenuous nature of Emily Carr’s vocation and the artist’s determination to persevere for her passion with the emotional support of her companions. Though it’s obvious that others looked upon her as “a strange bird“, including her sisters, Emily Carr’s depth of love for Woo is evident as a force that she could draw upon (no pun intended) and share with others….